MMFF 2013 Box Office results or ranking has been revealed after Day 2 of the festival (December 26, 2013). Same as Day 1, but partial figures show "My Little Bossings" and the Vice Ganda movie "Girl Boy Bakla Tomboy" are in tight race for being the festival top grosser, both earning record-breaking gross receipts during opening day. 3. "Pagpag: Siyam na Buhay"
4. "Kimmy Dora: Ang Kiyemeng Prequel"
6. "Boy Golden: Shoot to Kill (The Arturo Porcuna Story)"
7. "Pedro Calungsod: Batang Martir"
Meanwhile, early afternoon Thursday, Dec. 26 (festival's 2nd Day), the Metro Manila Development Authority (MMDA), who organizes the annual filmfest, finally revealed the official grosses for the three (3) top grossers during its opening in theaters last December 25. Kris Aquino shared same figure on Instagram, further revealing how much the movie earned in Metro Manila alone and in provincial cinemas as of 1st Day. That just means, with a record P134-million total grosses on Day 1, 91% of it came from the Top 3 films and only 9% or P12.3-million were contributed by the 5 other entries. 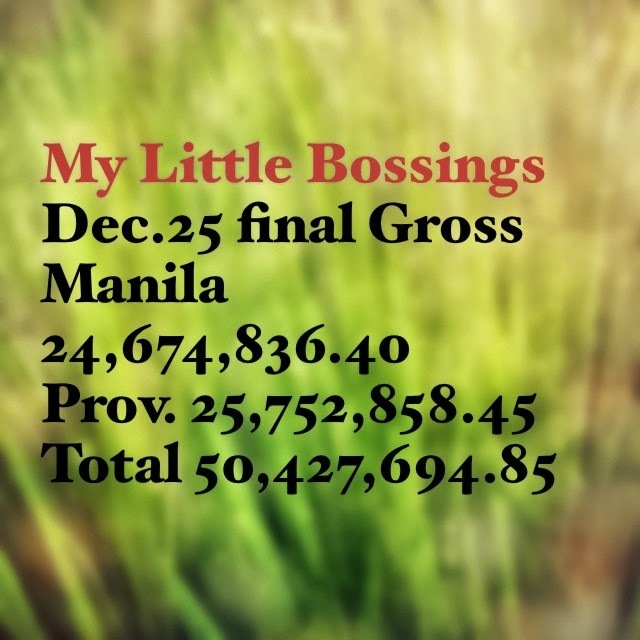 With those 1st day grosses of the Top 3, a final tally of at least P170-million is assured for "Pagpag", and close to P400-million for "MLB" and "GBBT" during the entire 2 weeks of MMFF 2013, which will end on January 7, 2014. "My Little Bossings" and "Girl, Boy, Bakla, Tomboy" both have beaten the opening day record of "Sisterakas" during last year's MMFF, while "Pagpag", starring Daniel Padilla and Kathryn Bernardo, now holds the highest opening day record for a Filipino horror film, beating 1st day grosses of the horror entries "Dalaw" (P12.5M) in MMFF 2011 and "Segunda Mano" (P18.25M) in MMFF 2012. These last 2 films, which both starred Kris Aquino, wound up respectively with P125M and P126.7M. It's also exciting to look forward to if Vice Ganda's movie "Girl Boy Bakla Tomboy" will overtake the Ryzza Mae Dizon-Bimby Yap movie "My Little Bossings" in the box-office race to #1, since their opening gross sales were so close. That could be a very big possibility. Tonight, Dec. 27, the 39th MMFF 2013 Awards Night is taking place at the Meralco Theater. Who will be the winners? I think the strong contenders for the Best Actor award are Robin Padilla, ER Ejercito, Rocco Nacino and Vice Ganda, while for Best Actress, frontrunners are KC Concepcion, Kathryn Bernardo and Eugene Domingo.